Recently I have mostly been getting… more plastics! Got another batch of finely detailed plastic miniatures from the 90s. 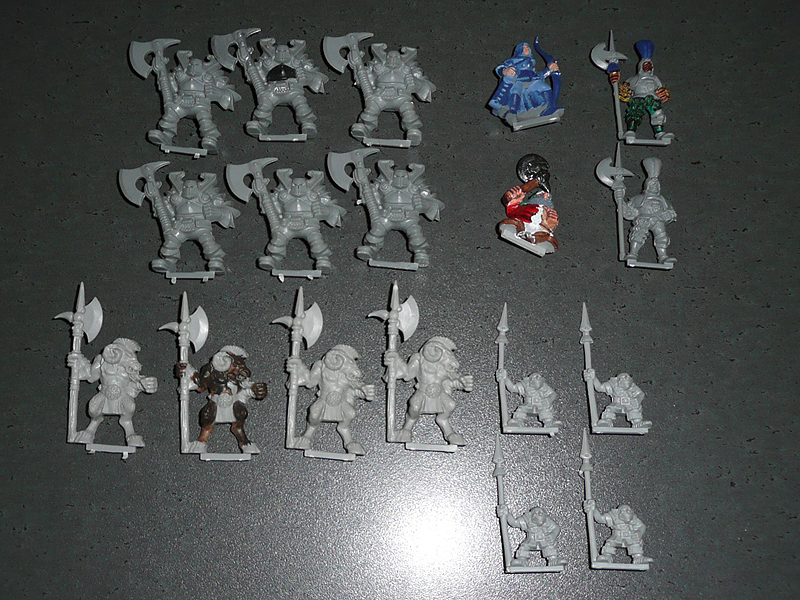 This time Steve (from Tea’s Getting Cold) took pity on me (I assume because of the suffering endured when painting 16 identical dwarfs) and shipped me a box of free swag in varying states of decay. Styrene for the styrene god! 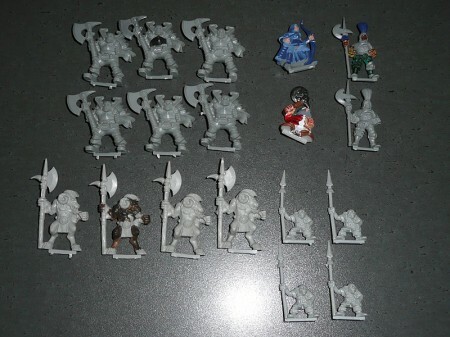 I got 18 intact plastic dudes (6 chaos warriors, 4 beastmen, 4 goblins, 2 empire halbardiers, 1 elf archer and a dwarf) and almost double that with cut off weapons. 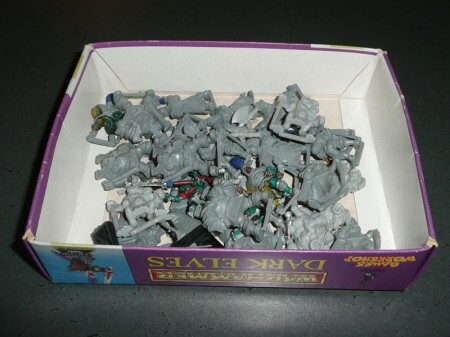 "Is that a beastman in your bitz box or are you just happy to see me?" This brings my total for 2012 to 62 painted – 238 acquired = -176. I’ve vowed to paint the 18 intact models before the end of 2012, so expect to see more painted dull plastic dross on here. 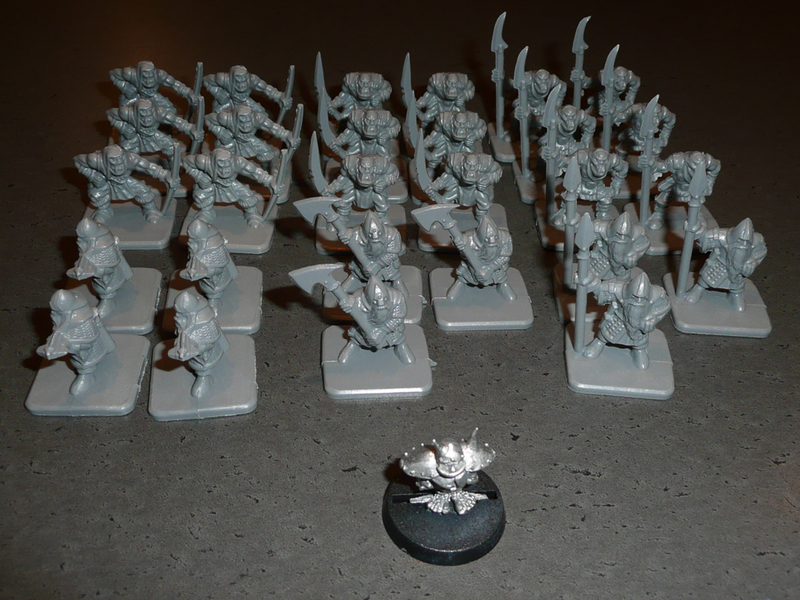 Before painting them, I’ll have another go at the Doom Forgers team for Dungeon Bowl. Ten more models to go there! I also have a very serious urge to paint up my “Chaos All-Stars” human team. I’ll postpone that to “after the plastics” though. Yeah, what the hell – Fantasy Battle?! I honestly can’t say what happened – but I picked up WHFB3 a few years ago and read the rules a month ago or so. It got me thinking that I ought to try it sometime. My basing standard doesn’t lend itself well to WHFB, so I started thinking about how I could arrange some cheap forces without too much hassle. I remembered the old 90s plastic single piece clone casts that are quite dull, but if painted properly can look good enough. I have 16 of the dwarfs, I’ve tried to sell them on many occasions but never succeeded. How fortunate! I’ve painted these as fast as possible, which in my case means black primer, base coats (with as few colours as possible) and then completely covered with washes. I then highlight using the base colour, and occasionally a lighter shade of the base colour. I’ll try switching up the base colours between my batches of five, the next five will have another blue for the tunic, and another brown for the boots and shoulderthingamajig. Here’s a pic of 6 of them. 10 more to go, and I have a unit. If I can (sloooowly, I’ve learned my lessons) gather some more dwarfness I should have about 1000 pts painted up “in no time”. 1000 points don’t make an army, but with 1000 pts worth of dwarfs, 1000 pts worth of men and 1000 pts worth of elves I ought to have enough to make one “good” army. I’ll do the same for orcs, goblins, chaos, skaven and so forth. 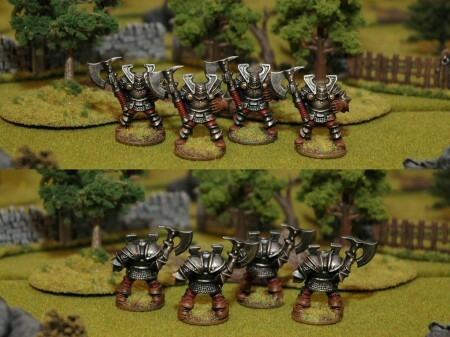 I’ll round that out with some of EM4’s quite genious plastic dwarfs from the old Fantasy Warriors boxed set, as they have crossbows and only cost a few pence each. 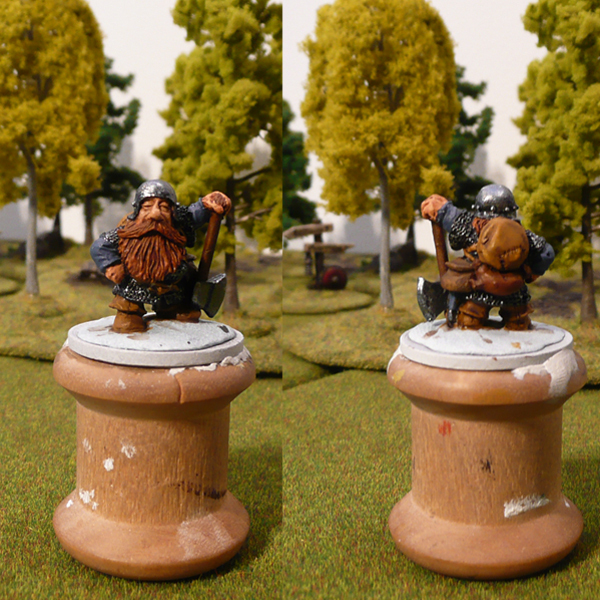 Finally, I’ve got a WIP pic of a dwarf I’m painting for Adam/thebinmann from LAF. I usually don’t post WIPs like this, but wanted to share the progress with Adam. Basecoat and shading, but no highlights yet. Edit: Forgot to update my tally for 2012! 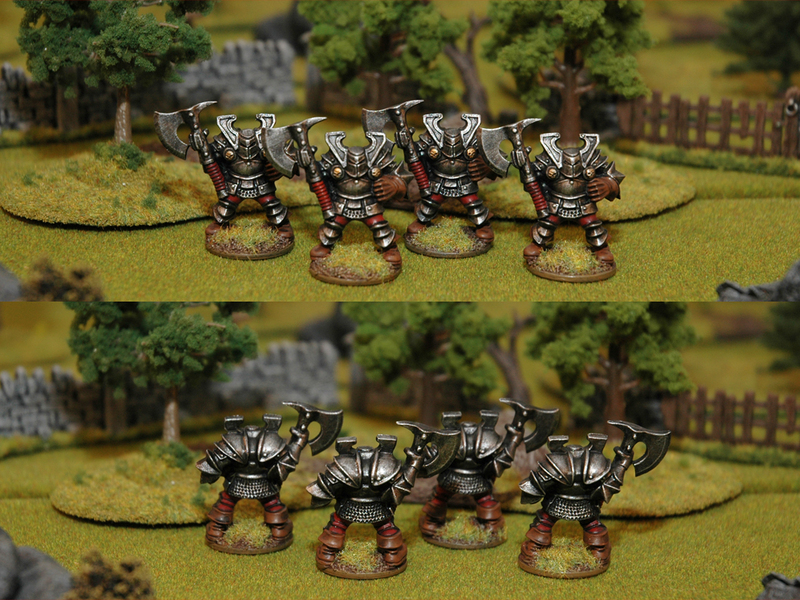 With these 6 chaps painted, I’m now at 50 painted – 189 acquired = -140. It’s getting better. Slowly. =) Nothing new for quite some time now, but then again I haven’t painted much either. 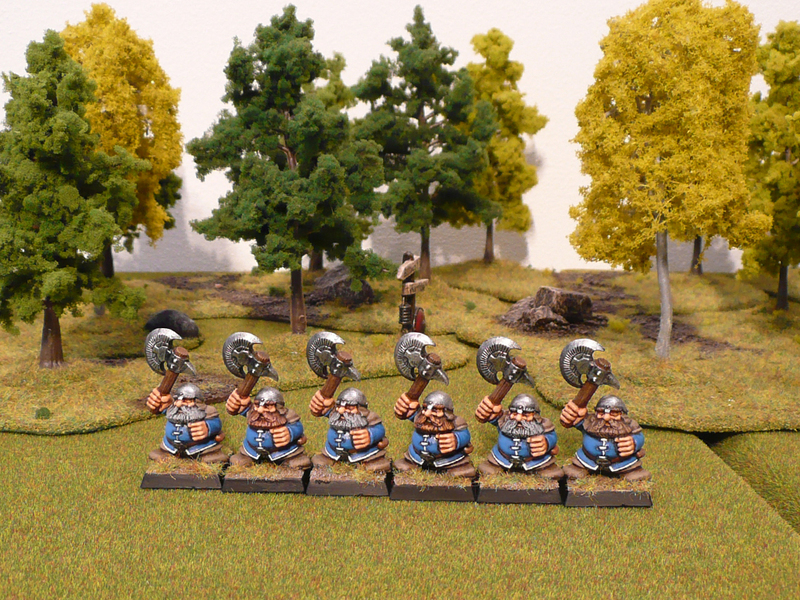 I’ll try to concentrate on smaller things for a while when I’m done with the dwarfs. Might help me bolster the numbers a bit. Got three models incoming, but more on that when they get here.